I had my second shoulder operation this year a week and a half ago. Post op I struggled a bit for the first few days due to some swelling that was hindering my ability to do the Physio exercises. Once the swelling went down I have dedicated myself to the Physio exercises with in pain limits. I still can't get full range of movement yet but I think its slowly improving. Before this last operation I did allot of house work and also made a few things. My daughter Melissa comes home for a week on Saturday so yesterday I tidied the spare room which is also my art space and found a few things to share with you. First is a steam punkish birthday card for eldest daughter Carlia's boyfriend Cory. Then I found two almost completed adjustable brass rings. They only needed a rivet to attach the top part to the ring which I did easily with my handy rivet/eyelet tool I got from Jen Crossley's shop. The left ring has a vintage typewriter key and the right a lovely metal rose embedded in Ice Resin. I've also uncovered an almost complete 3D etched, metal, house necklace, my 3D metal house (etched but not put together) and three puffy hearts awaiting transformation...all a great inspiration to go do more Physio exercises so I can get the strength back in my arm to get them done!! Are these rings going on Etsy?? I love everything about this card. The corrugated background, LOVE! The image, gears, rivets- all of it. Now I'm going to have to check out that riveting tool, too. Thank you for posting! I know I haven't been by for a while, but sometimes it is so hard to get around to visiting all my favorite blogs. 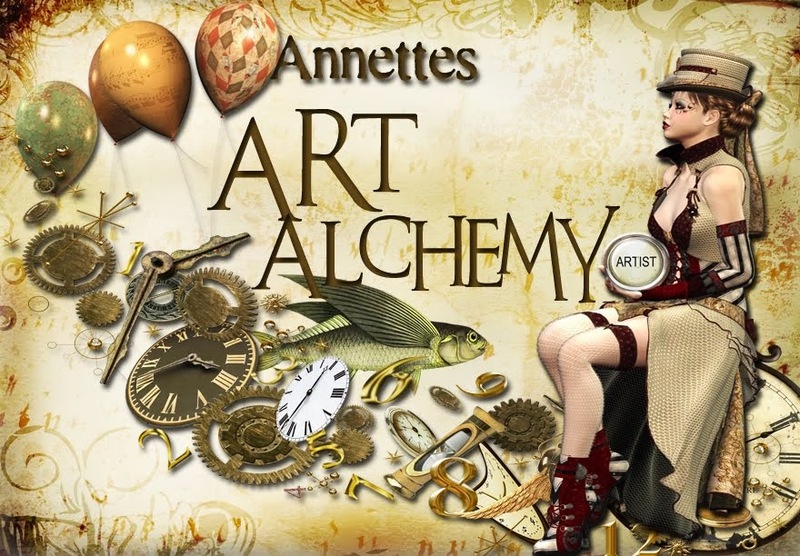 The pieces you have made are amazing, Annette! Your card is absolutely stunning, and I love the the rings. Very inspiring! I hope for a quick recovery...I can hardly wait to see what you are creating next.